← Which Brand(s) of Camera & Lenses Do You Own? 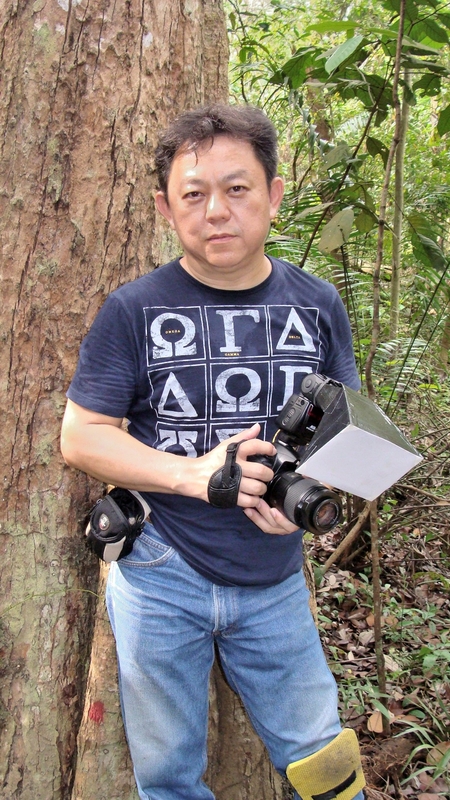 29th July 2014, Singapore – A week ago, the editorial team decided to post up a poll and find out what are the camera brands & brand of lenses that photographers of 2014 are using today. This is to understand the market & our audience better. Although we decided to keep the poll going, we had taken a screen shot of the results today at 0900 hrs GMT +8.00 which is exactly a week and check out the results. In total as of the time of the screen shot, the sample size is 5,192 persons polled. We shall start with the Top 10 Camera Brands. From the above, and as expected, Canon & Nikon are still on the top spots. The 2 long-rivaling companies had dominated the top spots worldwide and not just Singapore. In this poll, Canon topped the list with Nikon following close right half a step behind. In the last 12 months, Canon had gotten good sales from products like the EOS 100D, EOS 700D, EOS 1200D, EOS M, IXUS 265 HS, Powershot D30, Power N100, SX700 HS, G1X Mark II, and a couple of new lenses for their interchangeable cameras. Over to the other side, Nikon is selling lots of DF, D810, D4, D4s, D610, D7000, D5300, J3, J4, Coolpix P600, Coolpix AW120 & a few other interesting prosumer compacts keep up closely with Canon’s sales. What surprised most people (or should I say expected), Sony took the 3rd spot this time. The company’s E-mount α7 ( α7, α7K, α7R & α7S) had taken the market by storm, or should I say stormed. Apart from the earlier popular models, the rest of the line up that are selling well are α6000, SLT α77II, SLT α99, RX100, HX400, WX300 & TX30 making up the total sales and pushing Sony right to the 3rd spot. 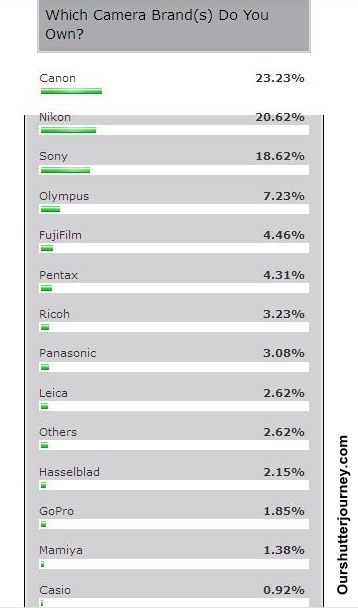 Keeping Olympus on the 4th spot, it has to be the success of Olympus’s OM-D (EM-10/EM-5). Backing up the sales are popular models like TG-3 TOUGH, Stylus SP-100EE, SZ-14, Stylus 1, XZ-2, Stylus SH-1 & VG-190. Fujifilm managed to secure the 5th spot with its recent XT-1 along with its siblings like the Finepix S1, Finepix XP70, X100S, X-M1, XQ1, X-E2 & X-A1. Usually I will not mentioned any brands beyond the 5th place but this is good to share. Following really close behind Fujifilm are Pentax & Ricoh (6th & 7th place). Pentax is moving lots of K-5IIs, K-3, K-50, K-500, Q7, while it’s sister company Ricoh is moving lots of GR and the re-labelled WG-4 GPS. Next we take a look at the Lenses that photographers are using today. Based on the camera ownership statistics on the earlier poll, Canon, Nikon took the top 2 spots as expected. 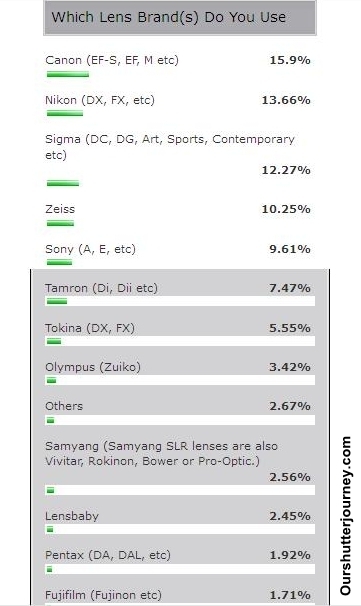 While I will conveniently sum up that Sony & Zeiss lenses are mostly bought by Sony users for their α-series cameras, the brand that had created a storm one after another and had landed itself in the top 5 is Sigma. Sitting on the 3rd place is Sigma. Since Sigma’s worldwide announcement of the company’s Global Vision – a re-branding exercise – the company had rolled out award-winning lenses one after another. The new series comprising of 3 product lines namely the Art, Sports & Contemporary lenses had surpassed the highest level of expectations from worldwide users. From our understanding, Sigma’s best selling lenses now is the 35mm ART. the 30mm ART, 50mm ART, the 17-70mm Contemporary, 18-35mm ART, 18-200mm Contemporary, 24-105mm ART and the mighty 120-300mm Sports. The other fast selling lenses that hasn’t been re-categorized are the 150mm Macro & 180mm Macro, the 10mm Fisheye & the recent DP2 Quattro. Following close behind Sigma is long time rival Tamron who recently released the 16-300mm mega-zoom lens for APS-C DSLRs. As camera & lens manufactures are constantly releasing newer & better photographic equipment to match up to the market’s standard and today’s technology, as photographers we should all improve ourselves and learn new things too (so that we can exploit the new releases) fully. This Poll had shown certain vital market changes & market patterns in the recent year when it comes to purchasing camera or lens. On behalf of the editorial team, we would like to thank you for taking time to poll. This entry was posted in Brand: Canon, Brand: Minox, Brand: Nikon, Brand: Olympus, Brand: Others (Cosina, Carl Zeiss, Leica, Mamiya, Samyang, Vivitar, Zenitar,etc), Brand: Pentax, Brand: Sigma, Brand: Sony, Brand: Tamron, Brand: Tokina, Featured Photography Merchants, Group Test & Reviews, Photography Articles & Videos and tagged Canon, Fujifilm, Lensbaby, Nikon, Olympus, Pentax, Photography, Polls, Sigma, Sony, Tamron, Tokina. Bookmark the permalink.